I am LDS, a member of The Church of Jesus Christ of Latter-Day Saints, known to most as the Mormons. Next weekend is General Conference, when we have the chance to listen to our leaders on a worldwide level. It’s always one of my favorite weekends – partly because they broadcast the service and I can watch it right at home on my couch in my jammies… yes, church in sweatpants. But with three little kids, it can be difficult to entertain them long enough to actually get to hear much at all. My mom always had fun little quiet activities for us to do while we were growing up and watching General Conference. 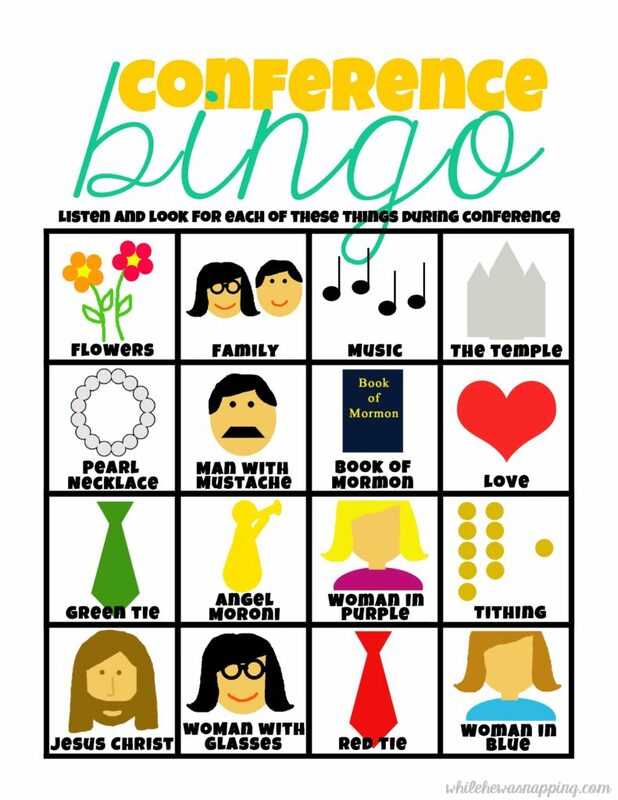 My favorite was always Conference Bingo. But the boards I remember were designed for much older kids than mine and there is no way I’d ever get them to sit and use it, so I created a Bingo board for my kids to use this year. I wanted something basic with simple, bright pictures that used both sight and hearing in order to get the bingo. I’m hoping it will encourage them to listen and watch, so maybe I can do a little of both as well. I’m not going to give them strict rules. If they notice “family”, whether it’s from a speaker speaking about them or if they see a family on screen, it counts. I didn’t want it to be so hard, they give up and return to the usually scheduled arguing, rough-housing and general horseplay that accompanies mom and dad trying to do… just about anything. I’ve got my fingers crossed.